AvDoc 51 is a fully operational aviation and pilot-oriented medical clinic that focuses on the care and well-being of aviators and flight crews with all levels of experience and backgrounds. Established as a “Squadron Flight-Line Clinic” in support of the high tempo and high performance flight operations routinely conducted at Stallion 51, AvDoc 51 is located within the corporation’s newest and most modern office building. AvDoc 51 offers full medical ophthalmologic & vision care that is tailored to the aviator and crew including: glasses refraction, glaucoma test and management, dilated retinal exams, diabetic retinopathy screening, cataract checks, color vision assessment and minor office procedures. Ophthalmologic Eye Emergencies should go to the nearest Hospital Emergency Room or call 911. Human Factors, Spatial Disorientation, G-Induced Loss of Consciousness (G-LOC), Hypoxia, Altitude and Breathing Oxygen, Physiologic Stressors of High Performance Flight, Aviator Health Care Maintenance, Aging Pilot Considerations, NTSB Mishap Review and more. Fees apply on an individual basis. Serves as the corporate officer in charge of the daily endeavors of AvDoc 51. 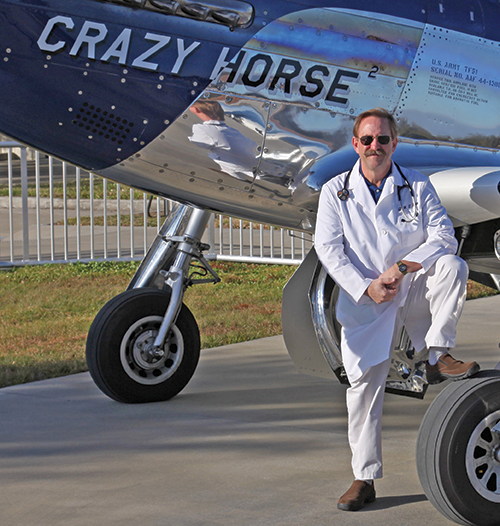 Dr. Busch is an accomplished Naval Aviator, Flight Surgeon, Ophthalmologist and FAA Senior Aviation Medical Examiner. Monday through Friday: 8:30 a.m. – 5:00 p.m.
Dr. William T. Busch Capt, USN (ret), grew up in the mid-west and upon graduation from college entered the U.S. Navy as an Aviation Officer Candidate in Pensacola. Graduating from Navy Jet Flight School, he received his Naval Aviator Wings of Gold in 1978 and deployed as a pilot flying missions from the deck of the aircraft carrier USS Forrestal. While there, he became a Wing Qualified Landing Signal Officer (LSO) and the squadron NATOPS Standardization Officer. In 1982 he was selected as the Atlantic Fleet Pilot of the Year. Dr. Busch then left the fleet to participate in the Navy health professions scholarship program, consisting of five years of medical training followed by Naval Flight Surgeon School. After receiving his Naval Flight Surgeon Wings in 1988, he returned to fleet service as a dual-designated Naval Aviator/Flight Surgeon. There, in addition to his clinical duties, he was a flight instructor pilot and re-qualified as an aircraft carrier pilot and LSO. In 1995, Dr. Busch completed training in Ophthalmology at the National Naval Medical Center and became Board Certified in that specialty. He served as the Chairman of Ophthalmology at Naval Hospital Camp LeJeune and in 1998 became the Chairman of Navy Aerospace Ophthalmology at the Naval Aerospace Medicine Institute in Pensacola. In 2001, he became the Head of the Navy Aero-Medical Dual-Designator Program and continued to fly as a current Naval Aviator in addition to serving as senior flight surgeon at Naval Air Station Jacksonville. He retired as a Navy Captain in 2005 after 29 years of military service. Dr. Busch has accumulated over 5,000 flight hours and logged time in over 30 different types of military aircraft. He has over 1,000 hours in WWII era vintage aircraft and hundreds of aircraft carrier landings. He is an Airline Transport Rated Pilot, a Certified Flight Instructor and Advanced Ground Instructor. Additionally, he is an Associate Fellow of the Aerospace Medical Association and is an FAA Designated Senior Aviation Medical Examiner (AME).